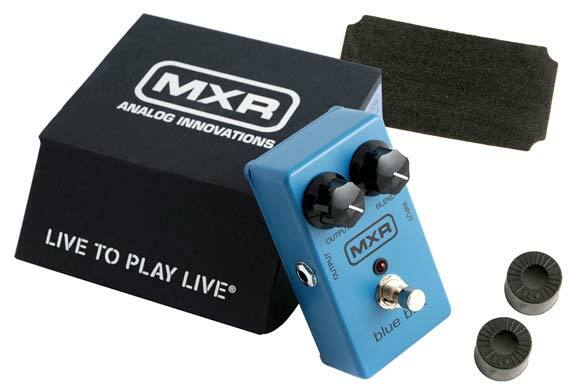 Shop MXR M103 Blue Box Octave Fuzz Distortion Pedal from AMS and enjoy Fast & Free Shipping. This unassuming little box shovels out enough low frequencies to scare a blue whale. It takes your guitar signal, fuzzes it up, then duplicates it two octaves down. You control the output and the mix between the dry signal and the effect. Using it 100% wet is quite an experience, but more recognizable sounds appear as you dial In more dry signal. The Blue Box is known for having a chaotic personality that can make each session a totally unique experience! Powered by a single 9 volt battery or Dunlop's ECB-002 AC adapter. Footswitch toggles effect on/bypass (red LED indicates on) Output knob sets total output gain Blend knob adjusts ratio of dry (clean) with wet (effects) signal. Dimensions: 4-3/8" x 2-3/8" x 1-1/4"
Got this as a fuzz option for my board, take a little getting used to and dialing in a far as where to place in the signal chain. But once I got it locked, it sounds awesome. From hard fuzz to glitchy square bass, this thing make some serious noise. Only downside is that it seems a little quiet when engaged, but some engineering the signal path can minimize it. A beast to be tamed. 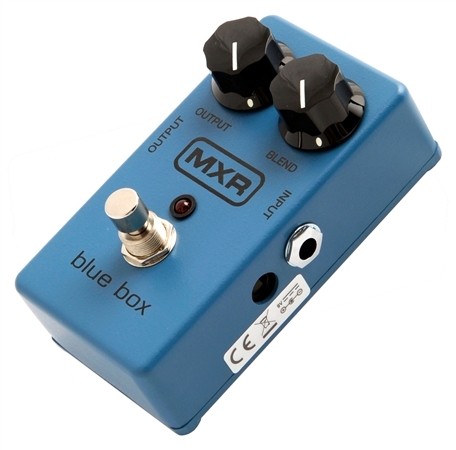 Owned this pedal about a year with no problems, but I've also owned other MXRs for much longer with no problems. High quality stuff. 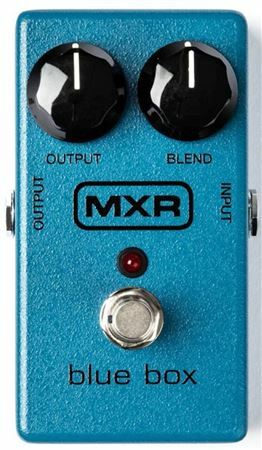 This pedal can sound amazing, though it can be tough to find the sweet spot. This pedal is one of a kind! Totally dependable, I could drop it of a building. This is a fun and quirky effect, but it's probably not for everyone. Looks cool, it's very well built, and most importantly it's analog. Rubber knob cover things make it easy to adjust with my foot. I looks super cool, I was disapointed when I got it though, I recieved one with the block logo instead of the script. Whatever, I had a feeling that was gonna happen... I opened it up and was like F@#%, Oh well. Hard to control, but that's the beauty of it...ala "Fool in the rain" Led Zep-Jimmy Page, yep this the one that makes that sound. Takes some practice and toying around. It's that sound as described above, otherwise not something you whip out for every solo! Is the Blue Box for you? Built with quality parts, and great cosmetics, looks great on my board. The knobs are big and it is very easy to disturb one knob when adjusting the other. I replaced them with a set of real bone knobs with a slightly smaller diameter, it now looks awesome, and easier to adjust. The features are Two knobs and an on off switch is all you need. The manual is not very helpfull, it should have some suggested settings for those that don't know what this pedal is about. If you know what this pedal is, and have a use for it in the style music you play, it is a great value, for what you get. Although the sounds you can get out of this are diverse, they are very limited to certain music styles. It does not play well with other pedals, especially modulation effects.